Muslim women, Native Americans, and LGBTQ candidates had a night of historic wins | "Global Possibilities"
Voters in the 2018 midterms chose to elect candidates who look, worship, and love like them. Minnesota Democratic Congressional Candidate Ilhan Omar will become one of the first Muslim women elected to Congress. Tuesday was a historic night for women and minorities in America, with voters sending the first LGBTQ, Native American, and Muslim women to the halls of Congress and governor’s mansions. More women will be serving in Congress than ever before after the 2018 midterms — many of them minorities as well. In Kansas, Democrat Sharice Davids became one of the first Native American women elected to the United States legislature; New Mexico’s Deb Haaland became the other. And Congress will get not one, but two Muslim women serving for the first time ever: Minnesota’s Ilhan Omar and Michigan’s Rashida Tlaib, both of whom won by resounding margins. Democrat Ayanna Pressley will become the first black woman to represent Massachusetts in the House. And South Dakota’s Kristi Noem — one of the only Republican candidates making history this cycle — became the state’s first female governor. It wasn’t only women who triumphed on election night: In Colorado, Jared Polis became the United States’ first openly gay man elected governor. And there were victories at the state level, too: Florida elected its first Iranian-American lawmaker to the state legislature. But 2018 wasn’t an across-the-board win for all the candidates looking to make history. Two of the races that had drawn the most attention in the weeks before Election Day went to white Republican men: Tallahassee Mayor Andrew Gillum lost his bid to become Florida’s first African-American governor by 1 point. And Democrat Stacey Abrams, who served as the minority leader of Georgia’s House of Representatives before running to become Georgia and the nation’s first black female governor, trails Republican Brian Kemp by about 75,000 votes. The slate of 2018 candidates mirrored the history-making turns that dozens of Democratic candidates for municipal and state office made last year: Transgender candidates won races in four states, cities in Minnesota and Montana elected their first black mayors, and Charlotte, North Carolina, elected a black woman as mayor for the first time. This year, candidates built on that momentum, as Vox’s Ella Nilsen noted, sending a clear message: America wants to elect candidates who actually look like the people they’re representing. Muslim women are coming to Congress, and they’re bringing their backgrounds with them. 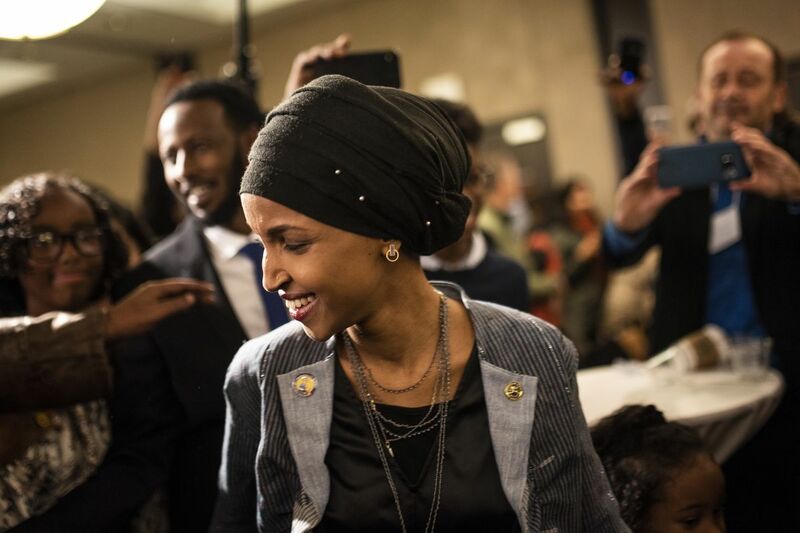 Omar, a 36-year-old Somali refugee who immigrated to the United States as a teenager, faced Islamophobic attacks during her campaign from outside conservative media outlets, who have baselessly claimed she was once married to her brother and has ties to terrorists. But those attacks didn’t sway the general election — Omar handily beat Republican Jennifer Zielinski in Minnesota’s Fifth Congressional District, for a seat once held by Rep. Keith Ellison. She’ll be joined in January by Michigan’s Rashida Tlaib — a Muslim former state representative who won her primary by running unabashedly to the left of the competition. Tlaib will replace disgraced Rep. John Conyers, who resigned after sexual misconduct allegations, in another safe Democratic district. Congress currently has only two lawmakers who identify as Muslim — and both of them, including Ellison, are men. 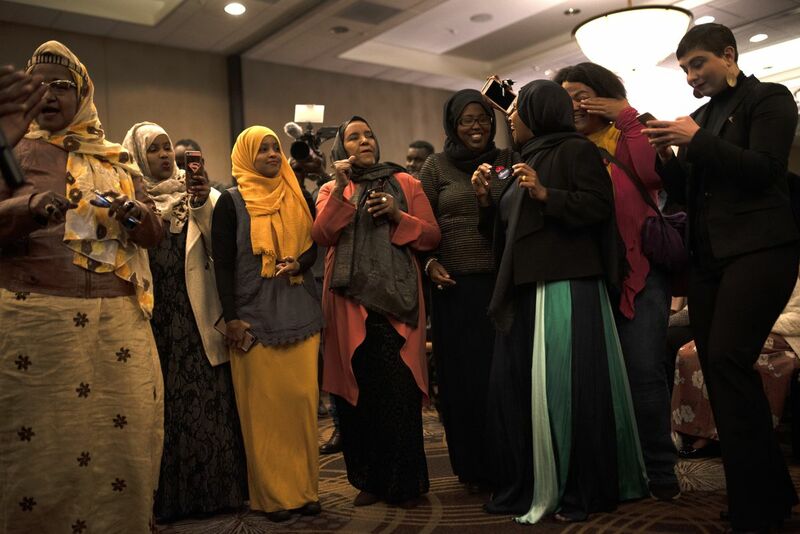 Supporters of Minnesota Democratic Congressional Candidate Ilhan Omar celebrate at an election night party on November 6, 2018 in Minneapolis, Minnesota. America doubled its number of Native American Congress members Tuesday. Deb Haaland and Sharice Davids won their races in New Mexico and Kansas, respectively, not only adding another two Native American lawmakers to the disproportionately white legislature, but also making history by becoming Congress’s first Native American female members. Haaland, a member of the Pueblo of Laguna and the former chair of the New Mexico state Democratic Party, won New Mexico’s blue-leaning First Congressional District. Once in office, she wants to give Native Americans more representation on crucial issues, including the environment and health care, she told Vox’s Ella Nilsen earlier this summer. Davids, a former mixed martial arts fighter and attorney, is the first Native American woman and the first lesbian Native American elected to Congress. She delivered a stunning blow to Republican Rep. Kevin Yoder in Kansas’s Third Congressional District, who served four terms in Congress and voted for both the GOP tax cuts and the GOP attempt to repeal the Affordable Care Act. 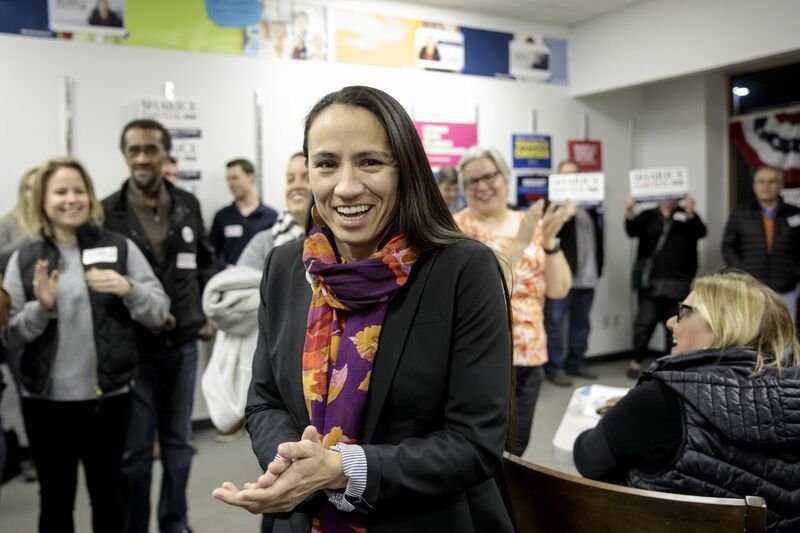 Democratic candidate for Kansas’s 3rd Congressional District Sharice Davids, is greeted by supporters during a rally at a field office on November 5, 2018. The following night, she became one of the first two Native American women to be elected to Congress. She won by balancing a blue resurgence that’s happening in Kansas’s Third with an appeal to the district’s moderate, suburban voters. But not all Native women were able to triumph in conservative territory. Idaho’s Paulette Jordan, who was aiming to become the country’s first Native American governor, lost to Republican Lieut. Gov. Brad Little. Jordan’s loss was unsurprising in the deeply conservative state, but Jordan made strides just in running — she was the first woman to earn the Democratic Party’s nomination in Idaho. Sharice Davids wasn’t the only one making strides for the LGBTQ community on Election Night. Rep. Jared Polis became America’s first openly gay governor, comfortably defeating Republican Walker Stapleton in Colorado’s gubernatorial race. Former New Jersey Gov. Jim McGreevey, a Democrat, came out as gay while in office in 2004. And Oregon Gov. Kate Brown, also a Democrat, is openly bisexual, which made her the first openly LGBTQ person elected governor when she won in 2016. But Polis is the first openly gay candidate to be elected for governor. Polis, a five-term House member, was certainly aware of the historical significance of his run, especially during the Trump era. “I think it really gives Colorado an opportunity to stick a thumb in the eye of Mike Pence, whose view of America is not as inclusive as where America is today,” Polis told Colorado Democrats earlier this summer. But he didn’t make his chance to make history on a national level the central focus on his campaign for governor. Instead, he ran on a bold progressive platform, proposing Medicare-for-all and universal full-day preschool and kindergarten for Colorado’s public school kids. 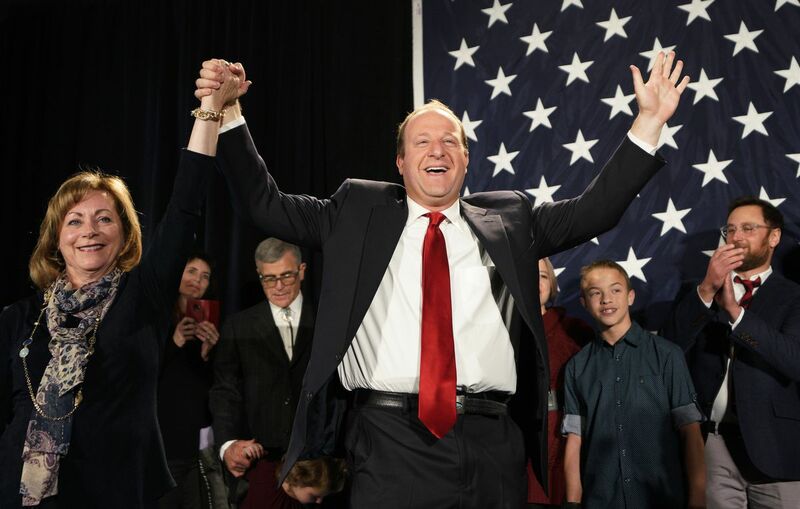 Democratic Colorado Governor-elect Jared Polis arrives onstage with running mate Dianne Primavera on November 6, 2018 in Denver, Colorado. Polis defeated incumbent Republican Walker Stapleton to become the first openly gay man elected governor in the country.